We’re hiring a Youth Program Assistant and Facilitator! This is a 6 month contract with opportunity for extension! This is an exciting and diverse role that allows for lots of creativity and learning! The Youth Program Assistant and Facilitator will work with BYTE – Empowering Youth Society and TakingITGlobal to promote and implement youth programming in Yukon. 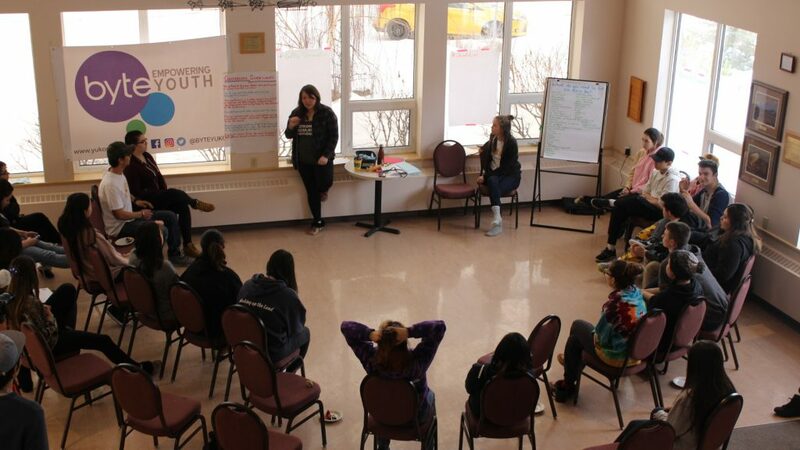 The core function of the Youth Program Assistant is to co-design and co-facilitate BYTE’s experiential workshops, to plan and implement youth events and to both promote and support youth applicants for the Canada Service Corps, #RisingYouth Community service grants in the Whitehorse and Yukon region. Working alongside our Community Outreach Coordinators and Manager, the Youth Program Assistant will be the lead on a number of special projects and events such as the Canada Day Skate Comp and the BYTE Battle of the Bands. This is an excellent, entry level position for anyone looking to gain experience working with Northern youth! Please note: While we welcome all applications, given the context in which BYTE works, preference will be given to applicants from Northern communities and/or Indigenous youth. Facilitate #RisingYouth grant ideation sessions with youth during community workshop visits and provide application support. Perform post-tour duties with Community Outreach Coordinators such as writing final reports, inputting data from evaluation forms, etc. Promote both BYTE & #RisingYouth events by creating posters, Facebook events, presenting to youth, etc. Coordinate logistics for BYTE & #RisingYouth events as needed, such as venue, event setup and tear down, food service, equipment rentals, etc. Reporting: Write event reports and recommendations and report on team activities and progress. Create presentations and booths for other events such as Volunteer Fairs, Townhalls, etc. Produce stories for BYTE and #RisingYouth’s website and blog capturing highlights of community activities, youth projects and stories. Contribute to daily office operations such as answering the phone, faxing, photocopying, responding to public inquiries etc. Job details: This is a 6 month contract position with opportunity for extension. The successful applicant will receive $20/hour and work a 35 hours work week. Please send your cover letter and resume to Shelby Maunder at ed@nullyukonyouth.com by Monday, April 8 2019. Join BYTE’s Facilitation Team Do you have a passion for youth issues and want to help young people throughout Canada’s north? Are you between 18 and 30? Are you interested in going on exciting tours throughout the Yukon, northern BC and NWT? Then BYTEs facilitation team might just be for you! If this sounds like you, click here for more info.